Contrary to popular belief, the cholesterol in the food you eat has virtually no impact on the cholesterol level of your blood. It’s sugar and carbs that trigger production of bad cholesterol in your body. So, eat your eggs and eat them whole — no more egg white omelets. When you eat fragmented foods, your body starts to crave the rest, and that can make you reach for something unhealthy. Egg yolks contain choline — essential for the functioning of all cells, especially brain cells — and deliver more of those good fats your body needs. We all know the dangers of excessive table salt intake, including high blood pressure, heart trouble, kidney disease and eczema. But few know how simple the solution is. 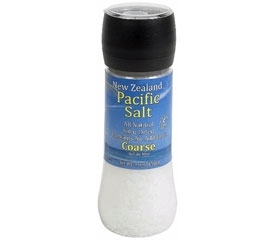 All of Pacific Resources International’s Pacific Sea Salt products are harvested from the pristine oceans around New Zealand, while also being naturally dried, containing no additives, and retaining all of the natural trace elements including strontium and naturally occurring iodine. More specifically, PRI’s Pacific Sea Salt is obtained from the energy-efficient method of solar and wind evaporation of sea water. This all-natural, age-old process, only where clean oceans can be found, retains the key minerals that play a role in keeping the body’s electrolytes in balance for a healthy lifestyle. Pacific Sea Salt from New Zealand contains strontium, which is essential to build strong bones and to help prevent osteoporosis that is common with women and as they age. Salt is not bad for you nor does it raise blood pressure. Rather, it is the insufficiency of other minerals that normally hold onto and keep water inside the cells that cause a rise in blood pressure. In fact, in conjunction with other minerals, when consumed correctly sea salt may actually lower blood pressure to normal levels! 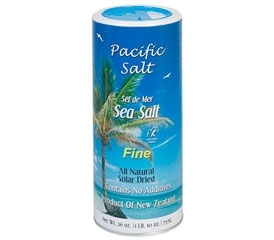 Pacific Sea Salt is more than just sodium chloride; it has all the natural trace elements in perfect balance. Foods such as eggs and sea salt get a negative reputation causing many people to steer away from consuming. As mentioned before they are in fact beneficial to our overall health. 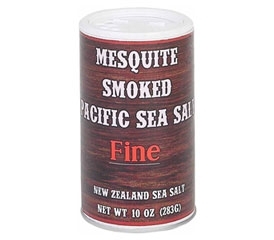 One health food trend that we can trust will never change is PRI’s Pacific Sea Salt. 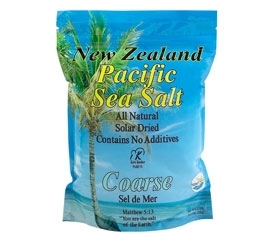 Visit Pacific Resources International for a variety of Pacific Sea Salt Products.